Ozarks Hydrographics is proud to announce the grand opening of our Free Forum! Here at Ozarks Hydrographics we want to offer the hydrographics market the best possible service and advice. We hope everyone can use this forum as a resourceful tool to help anyone in the hydrographics industry! We would love to hear all the success stories and see pictures of completed projects. We also want this forum to be useful for tips and tricks, along with helpful information for the new guys coming into hydrographics. 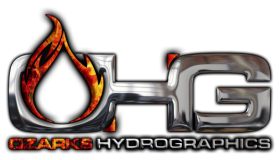 OHG is family owned and operated we will keep out all the vulgar language, and keep on topic with hydrographics. This Forum is designed for someone just getting in the hydrographics market or even the seasoned professionals. This is a free forum there is no charge for participation in this forum. This is a great resource for new products in the hydrographics market. Post pictures from your smartphone with Tapatalk on Ozarks Hydrographics Forum! This Forum will not allow demoralizing bashing or ridicule for your comments and opinions. We will not edit your opinions whether we agree or not, we welcome all opinions and believe together we can build this forum into a great asset for anyone in the hydrographics industry. 1000's of professionals trained and certified through Ozarks Hydrographics, come join our growing network of professionals!